My daughter and I are both watching our weight. I love to bake, but, unless we have guests, we find we can't resist second helpings. Yet we crave some baked treats. I have tried the cake slices available at the grocery store. They are usually either high priced or pieces of an ordinary sheet cake someone ordered and didn't pick up. The Smart Ones desserts are good, but a little expensive. Well, I found the solution at a Walgreens store. I was in their food section and spotted these little plastic wrapped cakes, carrot cake and chocolate cake. They were just enough for one serving and only .99 cents. I haven't tried the chocolate cake yet, but the carrot cake is moist and delicious with a light creamy frosting. It is better than most homemade. Also, the best thing is, I don't have the whole cake so I can't keep going back for more. I just pick up one little cake when I need a treat. Or two when my daughter is home from college. Here's a very thrifty way to make a single-serving chocolate dessert. I've saved four containers from the pricy Warm Delights Minis, because I think they work perfectly in the microwave. So I mix up four batches of the dry ingredients at a time. Then when I'm ready to make a little cake, I only have to add the oil, milk and vanilla. I use the Splenda/sugar mix product, so I adjusted that measurement to 1 Tablespoon. I also sometimes top the cake with a few mini marshmallows, chocolate chips and/or pecans before cooking. 1/8 teaspoon instant coffee crystals - optional, but brings out the chocolaty YUM! Spray a coffee cup or ramekin with vegetable cooking spray. In the cup combine the flour, Splenda, cocoa powder, baking powder, coffee crystals and salt until no lumps remain. Stir in the milk, olive oil, and vanilla until smooth. Bake in the microwave on high for 35 seconds. You may need to add 5 more seconds (maybe 5 more after that, depending on your microwave)- but don't be tempted to overcook or it will be rubbery! It should be moist on the bottom and will continue cooking as it sets. Serve with chocolate sauce, a sprinkle of powdered sugar, whipped cream or eat plain as a brownie. 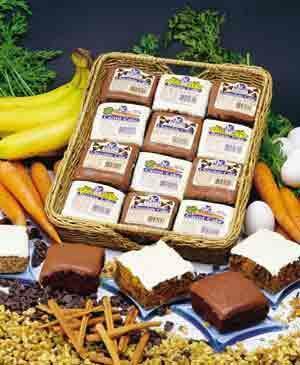 If you love the carrot cakes, you will love the chocolate! You are right, they are great for that need for cake, and they freeze really well. I put them in a zip lock for extra protection, but they don't last long! I love them. You can also get banana, red velvet, and double chocolate and order your own for home or business use. Oh, the humanity! Since we don't eat desserts like we used to, I still make them at home (to avoid the additives), cut them into portion sizes, and freeze them. I just make desserts less often.